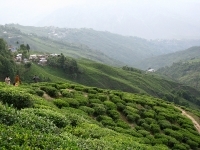 Darjeeling tea plantation © shankar s.
The tourist jewel of West Bengal, and the most famous of India's Colonial-era 'hill stations', Darjeeling has been extending a cool, alpine welcome to sun-soaked visitors since the mid-19th century. A town full of Victorian architecture, built into the foothills of the Himalayas, Darjeeling is not only picturesque but offers a wealth of interesting sights and activities to travellers. A mandatory thing to do in Darjeeling is take a ride on the Himalayan Railway (more commonly referred to as the 'Toy Train'), a narrow, winding journey through gorgeous mountain scenery. A UNESCO World Heritage Site, the narrow-gauge Darjeeling Himalayan Railway was opened in 1881 to establish a rail connection between the hill station of Darjeeling and Siliguri. These days, the 'Toy Train' is one of India's greatest tourist attractions, and an absolute must-do for visitors to West Bengal. Visitors are advised to take a day-trip from Darjeeling to Ghum (India's highest railway station), as not only are the views exhilarating, but the trip is taken in a British-built B Class steam locomotive. If at all possible, book a backwards-facing seat, to stare out at the plumes of steam trailing the diminutive steam-engine as it climbs through the Himalayan foothills. Trekkers will rejoice at the wealth of top-quality hiking trails waiting to be explored, the best of which are located in nearby Singalila National Park, while culture-vultures will adore the cultural diversity of the area, with its significant Tibetan community. There are beautiful Buddhist monasteries and sanctums to explore, and, of course, endless fields of the famous Darjeeling tea to enjoy. An absolutely wonderful place to cool off and recuperate after some hard travelling on the plains, tourists are urged to make Darjeeling a part of their Indian adventure.